Magellan scanners from Datalogic can be found in almost any large supermarket chain in Europe. With the Magellan, Datalogic has been the market leader in this sector for many years. Of course this exceptionally large market share is not a coincidence the new 8300/8400 series continues Datalogics concept for success with uncompromising reliable POS scanners for highly professional applications at an excellent price-performance-ratio. These scanners offer state-of-the-art technology that guarantees high throughput and improves employee performance and service life. Queues and failures are reduced to a minimum. The main advantages of the Datalogic Magellan family provide a significant performance boost and higher productivity. System integrators have more satisfied customers and the certainty of providing extra value with one of the best available solutions. 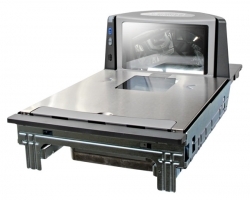 Magellan scanners are extremely reliable and of high quality, which ensures a smooth running system. Additionally, these scanners offer unique features that give them various advantages over comparable products. According to the manufacturer, the scan performance, throughput and scan rates are unrivalled on the global market. Efficiency of POS stations can be increased significantly, especially in low-margin retail sectors where every single factor can effect loss and profit. The Magellan series offers various models 8300/8400, 8500 and 8600 that are optimised for different customer requirements. Devices of the 8300 and 8400 series provide the same scan performance. However, the Magellan 8400 also includes integrated scales and an optional customer display, and is used for certified applications at service counters or weighing mail order goods, among other applications. On request, integrated products of specific scales manufacturers e.g. Bizerba, Mettenler-Toledo, etc. are available as well. Both models offer genuine five-sided bi-optic and omnidirectional scanning. This means the scanner detects the bar code regardless of the alignment with the object, simultaneously in two directions. The bar codes are scanned from 5 of 6 sides of the scanned object all sides except the top. This saves users from having to search for bar codes or aligning the scan window. Simply passing the code along the scanner is sufficient. At the same time, the scanning speed has increased enormously and queues are prevented effectively. A high scan rate of 3,900 scanlines per second in combination with sophisticated decoding electronics ensure that the bar codes are detected under any conditions including torn, damaged, heavily stained, uneven or badly printed codes. In addition to improved scan rates, the Magellan 8400 also offers highly reliable weighing the patented All-Weighs scale pan reduces weighing-related losses tremendously. Many objects in food retail businesses are not suitable for small scale pans and can yield incorrect values. Eventually, the weighing loss exceeds the profit margin of many of these products. Furthermore, the new Magellan series comes with improved power saving capabilities that reduce power consumption by up to 77 - a feature that lowers expenditure and is environmentally-friendly. A flexible interface solution that covers all established interfaces and offers extensive evaluation and analysis functions completes the scan features of the device. Compared to the Magellan 8300, the Magellan 8400 offers a higher scan rate and an extended range of functions its analysis features help to identify poor recurrent bar codes and performance benchmarking, as well as evaluation of user habits e.g. a user focuses on one scan window only and tries to align the bar code unnecessarily. Optionally, the Magellan 8300 as well as the Magellan 8400 are available with EAS deactivation functions. Security labels by Checkpoint or Sensormatik are then deactivated automatically with a deactivator from the EAS manufacturer and do not trigger the alarm. Datalogic Magellan OSP cable - OSP programming cable for Datalogic Magellan 2x00/8x00 series.